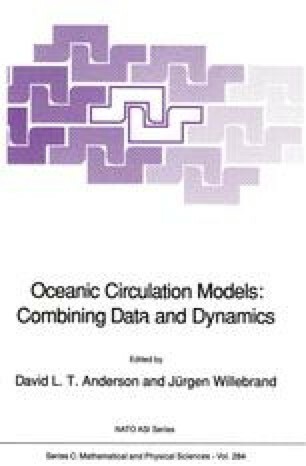 Several inverse models have recently been put forward for obtaining estimates of the unknown reference velocities on the basis of the balances for momentum, vorticity, heat and salt of the large scale geostrophic circulation in the ocean. Notable forerunners are the inverse method proposed by Wunsch (1978) and the β-spiral method of Stommel and Schott (1977). These have first been applied in strictly adiabatic versions in the North Atlantic (see also Wunsch and Grant 1982, Schott and Stommel 1978). Both approaches can be extended to diabatic conditions. For the β-spiral model the consideration of the diffusion terms in the balances for tracers and vorticity are conceptionally simple (e.g. Olbers et al. 1985, Bigg 1985). Also Wunsch’s method has been generalized in this respect (see e.g. Wunsch 1984). We should also mention Hogg’s model (Hogg 1987) which is an inversion of the advective-diffusive balances on two isopycnals subject to the geostrophic constraint between the isopycnals. The model was applied in the central North Atlantic.